Interested in becoming a Personal Trainer? You must be 16 or over to take part in the course. You do not need any previous qualifications or experience to start this course. This course comprises both the level 2 gym and level 3 personal training certificates. You can study at your own pace – with our online learning programme. On completing the course you will have an industry recognised qualification – enabling you to start working as a personal trainer immediately. 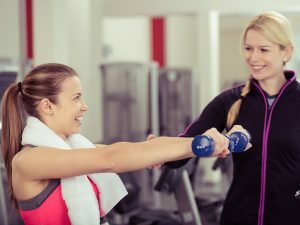 With our Combined Level 2 Gym Instructor and Level 3 PT course – you will be able to qualify as a personal trainer in as little as 6 Months – with no previous qualifications or experience needed. Our course is accredited by REPS – the Register of Exercise Professionals – and is worth 40 Reps Points. Upon completing the course – you will have an industry recognised qualification and will be eligible to work as a personal trainer in any gym or fitness centre in the UK. At YMCA Lincolnshire we use a blended learning approach of practical learning and independent study. You will learn the practical elements of the course at our award winning Lincolnshire Centre – where we provide a friendly and supportive learning atmosphere. We are passionate about teaching and enabling our students to deliver Personal Training at the highest professional standards. You can complete the theory elements of the course at your own pace – with our online learning programme. While you are studying we will be in regular contact to monitor your progress and answer any of your questions. We provide the best value Personal Training course in the UK – just £995 for the Combined Level 2 Gym and Level 3 PT Courses. You can pay for the course in 1 instalment of £995 or in 6 monthly instalments of £165.84 each. Learn more about the course by hearing from our past students. Why qualify with YMCA Lincolnshire? Our Combined Qualifications are Nationally Recognised and REPS Accredited. You will have peace of mind, knowing that the REPS qualification is recognised by the fitness industry – and that you are eligible to start work as a personal trainer as soon as you have completed the qualification. Only £995 for the Combined Level 2 Gym and Level 3 PT Courses. Our programme includes 12 contact days – more than many other fitness course providers. The course will provide you with the knowledge and skills to deliver personal training sessions effectively and safely. We have a blended learning approach: you will learn the theory elements through our online learning platform, and the practical elements during 12 contact days at our Lincolnshire centre. To gain the Level 2 Gym Instructor and Level 3 PT Certificates you will need to pass the practical and theory based assessments – which will take place during the 12 contact days at the YMCA Lincolnshire centre. Our online learning platform allows you to study the theory elements at your own pace. The online course usually takes about 60 hours to complete. This includes online practice assessments so you can measure your progress. You will have full access to the online courses – as soon as you make the first course payment. Our friendly and enthusiastic trainers are passionate about the course and committed to supporting you to deliver personal training at the highest professional standard. In addition to the tutoring during the contact days – we will be in touch online and over the phone during the independent learning part of the course. For instance – when you complete an online test, we will phone you to give feedback – and we will explain any theory elements you find difficult. The course takes a minimum of 6 Months to complete – including independent study and contact days. We recommend that you spend 30 hours working on the online learning platform before starting your first contact day. The 12 contact days will consist of theoretical and practical workshops, revision sessions and assessment – giving you the support and experience to reach your potential. Start working towards the course today! As soon as we receive your first payment – we give you full access to the online course materials. All attendance days are 9am – 5pm. We recommend that you spread the 30 hours of online learning over a minimum of two months to give you plenty of time before the contact days start. *In order to enrol onto the Level 3 Personal Trainer course, a valid Level 2 Fitness Instructor qualification must beheld. One straightforward payment with immediate access to online course materials. 6 easy monthly payments. Includes immediate access to online course materials. To arrange payments, ask a question or find out more about this course contact our friendly team on 01522 888218 or use the form below and we’ll get back to you.